As I (finally) finish up my Master’s degree at the University of Texas at Austin, I’ve been encouraged (or perhaps more accurately, assigned) to update and improve my website. My new updated site includes upcoming events, pictures from past events, and this brand new blog! What year is it? How late am I on the blogging trend? Tonight I’m gearing up for a performance this weekend with UT’s Gamelan Ensemble, where you can witness me and many others playing various metallophones and gongs and such. Gamelan groups have always fascinated me, and getting to participate in this ensemble this semester has been super fun. Flutists should get to play percussion instruments more often! I had the absolute pleasure of witnessing the Mozart Requiem Undead earlier this week, put on by the Golden Hornet Project, the Texas Choral Consort, and the Fusebox Festival. 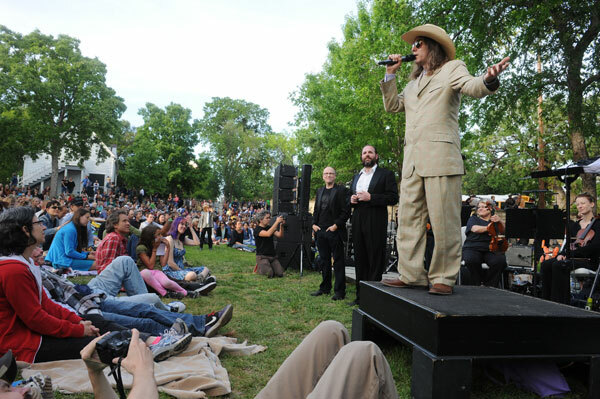 The audience sat outside on the lawn at the historic French Legation Museum as we listened to a fresh re-interpretation of Mozart’s funeral mass, which was never completed due to his untimely death. Each movement featured a different composer’s rendition and there was a wide range of performers including full choir, orchestra, mega percussion, guitars, bass guitar, drum-set, synthesizer, electronics, and organ. I remarked to a friend that I couldn’t remember the last time I’d seen that many people at a classical music concert in Austin. DJ Spooky’s movement began with bass pounding through the speakers and I must admit, it got my booty shaking and I had to strongly resist the urge to stand up and dance. This to me is a sign that the face of classical music is truly changing and striving for more inclusion–forget the rules! Those old rules of classical concert halls, where audiences are silenced and heavens forbid there is clapping between movements, is a tired and stodgy formality that no longer serves the public at large. The audience loved the music and I spoke with several colleagues afterward who all expressed enthusiasm at being a part of such an inventive program. Classical music is alive, people. It is these events in life that make music so powerful and moving.